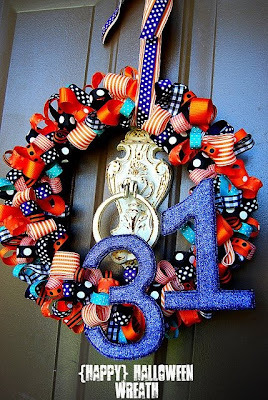 It's time to decorate those front doors for Halloween, and there are a few wreath projects I've come across that might inspire you. Great ideas from some fabulously talented women! If you'd like to add a little twist to the typical orange and black, try out some Halloween PINK this year. 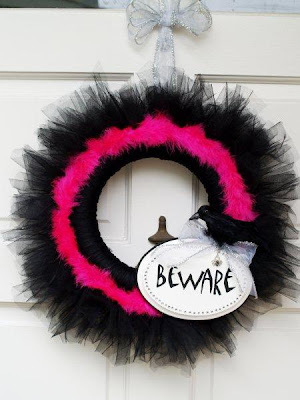 I'm loving this black tulle and fushia boa wreath from Flamingo Toes . She's got a great how-to so if you're lovin' the tulle, go see her blog and make one of your own. I have to say, this one is probably my favorite! LOVE, LOVE, LOVE the bright loops of ribbon and the bedazzly, glittery purple 31. To see more photos and other great projects, go check out Tater Tots and Jello. 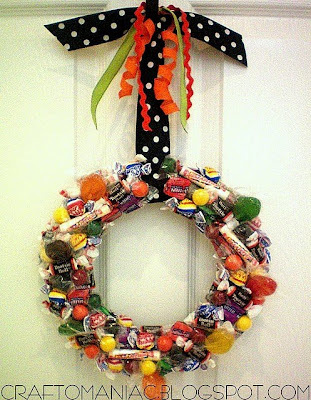 And today's our lucky day -- she's posted a great wreath tutorial, too! Fabulous! And a similar one from The Picky Apple - ADORABLE - so full of bright, happy Halloween colors! And she has a great tutorial, too, so make sure you check it out. 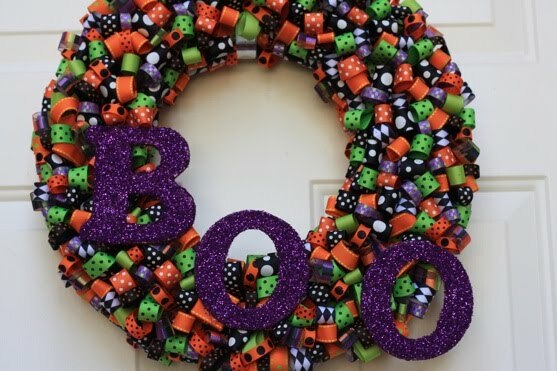 So maybe not a project with the kids, but they sure will love coming home to this cute little door wreath from Craft-o-maniac. That is, if they don't steal all the candy off of it first! Kind of creepy, kind of cute.... if you've got boys, this door wreath will surely be a hit! Ping Pong Balls from the Dollar Tree! Now that's my kind of girl! OK, so it's not a wreath. But it IS cute, isn't it? 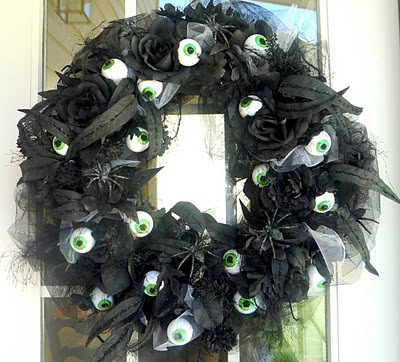 And it still hangs on your door, so maybe that kind of qualifies for my wreath post. 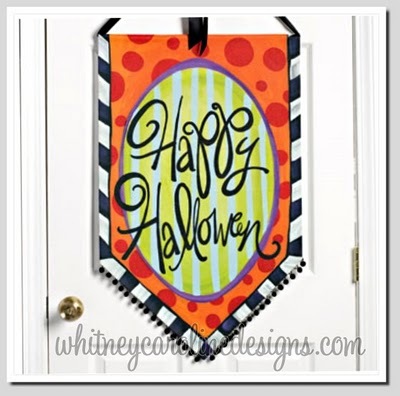 Nevertheless, I love this door banner from Whitney Caroline Designs . What a fun greeting for those little trick or treaters! If your artsy, give it a whirl making your own version. If paint and canvas isn't quite your thing, head on over to Whitney's website and order one today. Fantastic, Whitney! Now for a few bits of GOOD NEWS to share..... I need to do a little catching up on my thank yous from yesterday.... it's been quite busy around here! Thanks to Be Different.... Act Normal for their feature on my Shindig Halloween Party Printables - and for their shout out to my Star Wars party, too! We worked on a printables giveaway together and the winner should be announced today! Thanks to Catch My Party for featuring Shindig's Halloween Dessert table as their Party of the Day! What a great website full of inspiring parties! And last but not least, THANKS TO ALL OF YOU for getting this little blog 'o mine to over 40,000 hits yesterday!! I'm so grateful to all of my readers for the support you've given me with my new business venture. From the bottom of my heart, just know that it means the world to me! Thanks so much for featuring my Ribbon Wreath today! That absolutely made my day. And WOW! Congrats on the 40,000 hits yesterday...that's amazing!